Pruning shrubs and trees is so often conceived and performed as a perfunctory chore; something along the lines of cutting a hedge or mowing the lawn. ‘That plant has got too big’, its owner thinks, ‘I must cut it back’. It is interesting to speculate in these cases under which value system the plant can be considered too big. Sometimes, this can mean nothing more arbitrary than that it is bigger than about the same time a year ago, when it was cut back last time. But more often than not there is a practical rationale behind this impulse towards grabbing the shears. The plant is now obstructing a path, or, heaven forbid, competing with one of its neighbours in a border. No matter what the motivation, this practice, any practice that can be performed with shears or a sweep of the hedge-cutter, should not be considered pruning at all. A certain sort of practitioner may choose to demonstrate their subtlety by foregoing their usual preference for the mastery of a rectilinear shape; instead, they wield their chainsaw to create a ‘blob’. They are satisfied that this concession to organic form elevates their practice to ‘pruning’. But of course, it doesn’t. Good pruning has to start with good planting – if a plant is to be allowed to flower or express itself in any other way it needs to be allotted sufficient space to do so. We all make mistakes in this sphere. Or sometimes what has been a satisfactory planting scheme over a number of years outgrows itself and needs a re-think. Often the only solution to this sort of problem is a straightforward one – removal. But it is surprising how much resistance one encounters when making this suggestion. People will look at their mutilated shrub and then look at you as if you were the butcher. ‘But the birds nest there!’ they exclaim, once they realise you are not changing tack. This sudden impulse towards ornithology is brought to mind not by actual birds’ nests, but by the chaotic agglomeration of crossing twigs and dead wood that stands before them. Pruning must be considered a creative and highly technical endeavour if it is to be done well, like most gardening tasks. Please, save the shears for hedges and approach your shrubs with a mind as sharp as your secateurs. 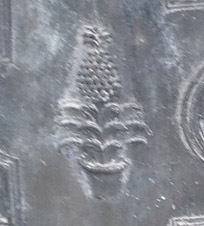 I often come across the emblem of a pineapple in the garden antiques I find which made me wonder what the connections were between English gardens and this rather exotic fruit. 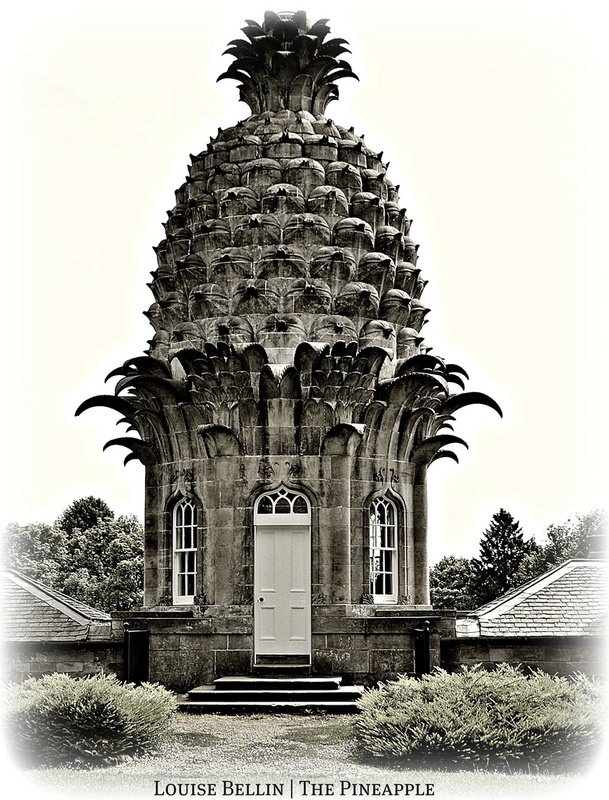 There are wonderful examples of carved stone pineapple finials to be found, emblems in lead cisterns from the 18th century and even a famous tower of the folly at Dunmore in Scotland. Originally discovered by Christopher Columbus in 1493, it took around 150 years before Europe managed to convince its first pineapple to fruit. Due to the trade connection with the Dutch West India Company the pineapple hit Europe’s shores early in 17th century and it is thought that pineapple plants first arrived in England when a Dutch collection was shipped to Hampton Court in the late 1600s. A ripe pineapple was meant to have been presented to King Charles 11 at Dorney Court, a tudor manor house, in Buckinghamshire. Apparently grown in the kitchen garden there. It was during the 18th century that the real excitement and display of this exotic South American fruit began to grow in this country. With royalty, nobility and even the gentry it became a show of wealth and skill of growing. It certainly was a skill to grow. It is said that pineapple hot houses were sunk into the ground lined with manure which produced heat like a compost heap. The pineapple would not of course ripen unless in a hot environment. The mania for growing extended throughout the Georgian period – hence the fruit’s inclusion in the decoration of the time. Stone would not be so interesting without the colourful lichens which grow on it. They give it character and age and I find them surprisingly interesting. They give us information about their life and the life of the stone, bark, tree or whatever it is that they are growing on. They are, of course, a type of fungus. In fact they are somewhere between a fungus and an alga by definition. They are symbiotic – ie they are two organisms co-existing by supplying each other’s chemical needs. Chemicals which they cannot produce themselves. There are around 15,000 different lichen species in the world and they have been used in the past for many things – from making dye for cloth or wool to being used as gauges for air pollution or to give some idea of time and age. They are very slow growing with many only increasing in diameter by 1 millimetre or less per year. Examples on stone can be gauged at hundreds of years old by their type and size. The oldest recorded living thing in the world is a lichen around 19in / 480mm wide in Swedish Lapland - considered to be around 9000 years old. They are of different forms – crustose (forming a crust) – mostly found on stone; leafy or shrubby lichens hanging in trees; integral - lichens found within their host. They come in many colours. If you look at different types of stone and where it has originated from the differences are many and varied. Limestone particularly attracts wonderfully coloured lichens – the differences being caused by the character of the stone itself and obviously the environment in which it has been. The air quality and the atmosphere. temperature and rainfall. Metals, acid in rainfall, smoke and other pollutants in the atmosphere are detrimental to the growth of lichens. They thrive in good light where the air is clear and clean. Tree lichens will show clearly if air quality deteriorates as they are badly affected by pollutants the introduction of pollutants. Lichens die as towns spread as they become starved of light and in cities where the air quality is poor. They cause little or no damage to the surfaces they grow on. speed up the process, considering how incredibly slowly they actually grow I doubt it has much effect at all. More likely to grow mould. There is nothing that beats the real thing. Who can resist the wonderful deep verdigris colours of coppers at this time of year with all the deep reds and oranges in the autumn pallate. small riveted English copper copper. An original 18th century washing vessel. In remarkably good condition with a glorious wealth of verdigris colouring to the metal. In between we have an array of shapes and sizes of pots. One other English one and other shapes of French coppers. Whether planters or pools, with their depth of colour throughout the winter they really earn their place in our gardens. It is so long ago now but I cannot finish the newsletter without mentioning, or at least showing the pictures of two very key elements of this year's show. Two small marble figures - both have a really serene, quiet nature. One a fountain but does not need to be one. Beautifully carved, the features of this are really lovely. Slight damage to the lip of the fish. worn and has a lovely feel of quiet to her. She is on a carved marble pedestal. I would love to find her in a quiet place in my garden. White marble has a cool quality to it that I am only really just discovering. The large statue we had of Flora during the summer was the same. For our current stock visit our antique garden stone statues page. There is still a wedding glow beaming out from Cowsden following our daughter's wedding celebrations in the garden here in early August. The most beautiful day. Citrine Wagtail - Could it be? Possible siting of a Citrine Wagtail here at Cowsden mid October. On the tail of the hurricane in the high winds a pale yellow headed wagtail (just like the one in this picture)landed on a table outside the french windows and then fluttered up at the glass, plainly fighting its own reflection . I luckily was just on the other side of the window. It was yellow headed and chested with pale grey/black/white wings and back. Sadly didn’t get a photo but intriguing to say the least.